Director – Susanne Bier, Screenplay – Eric Heisserer, Based on the Novel by Josh Malerman, Producers – Dylan Clark, Chris Morgan & Clayton Townsend, Photography – Salvatore Totino, Music – Trent Reznor & Atticus Ross, Visual Effects Supervisor – Marcus Taormina, Visual Effects – Industrial Light and Magic (Supervisor – Jeff Capogreco), Instinctual (Supervisor – Jesse Morrow), Mammal Studios (Supervisor – Gregory Liegy), NVFX (Supervisor – Chris Holmes) & Scanline VFX GmbH (Supervisor – Jan Krupp), Special Effects Supervisor – Mike Meinardus, Creature Designs – Crash McCreery, Production Design – Jan Roelfs. Production Company – Dylan Clark-Chris Morgan. Malorie Hayes, along with two children Boy and Girl, sets off on a perilous journey down a river to find a sanctuary. All three of them travel in a canoe blindfolded and Malorie issues stringent warnings to the children that they will be killed if they take the blindfolds off. Five years earlier, Malorie was an artist and pregnant. Returning home from her obstetrician with her sister Jessica, she was witness as people everywhere were affected by an outbreak of mass insanity that caused them to have visions and then kill themselves. As Malorie watched, Jessica calmly walked over and sat inside a burning car. She was granted refuge, along with several others in the home of Douglas whose wife succumbed after going out to aid Malorie. They deduced that there were creatures prowling outside and that if one were to open their eyes outdoors or even look out the window, they would be affected by the mass insanity. They kept the blinds down on the windows and were able to go and get supplies using blindfolds and the satnav of a blacked-out car. However, a new threat emerged with people wandering in the aftermath of the catastrophe who would attack the unaffected and remove their blindfolds. The house came under attack after they let one such person inside and he opened the blinds. Bird Box proved to be an enormous successes for Netflix when it aired – apparently so much so that the channel had to air warnings for people to try conducting their own Bird Box Challenges (trying to perform various tasks while blindfolded), which were popping up all over YouTube. The film is an adaptation of Bird Box (2014), the acclaimed debut novel of Josh Malerman, the lead singer of the indie rock band The High Strung. The script comes from Eric Heisserer who wrote A Nightmare on Elm Street (2010), Final Destination 5 (2011), The Thing (2011), Lights Out (2016) and most notedly Denis Villeneuve’s Arrival (2016), which won him an Academy Award for Best Adapted Screenplay. The director is the Danish Susanne Bier who made In a Better World (2010), which won that year’s Academy Award for Best Foreign-Language Film, as well as the English-language likes of Things We Lost in the Fire (2007) and Serena (2014). Her selection here was quite possibly due to the success of her previous work, the acclaimed tv mini-series of John Le Carre’s The Night Manager (2016). 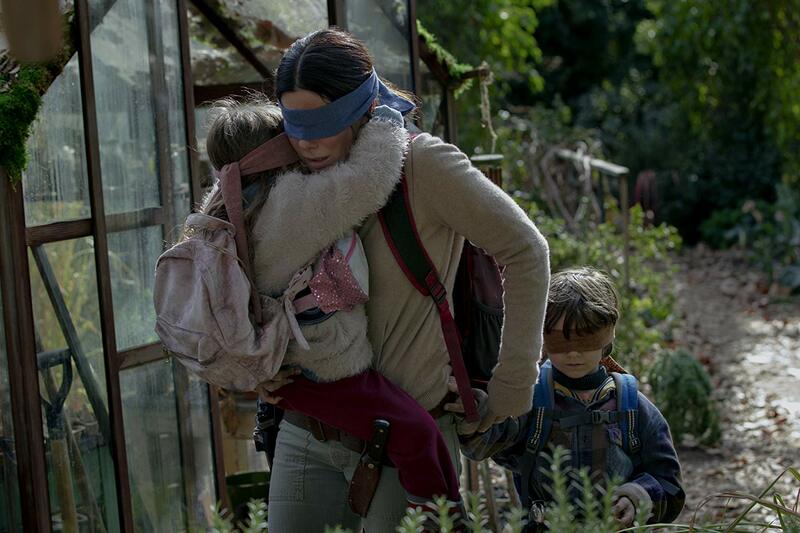 People were quick to compare Bird Box to A Quiet Place (2018), a theatrical success from seven months earlier in the year, of which there are undeniable similarities – A Quiet Place featured a family forced to not make a sound less they be killed by creatures with ultra-sensitive hearing, while this features people forced to remain blindfolded and not look outside unless they be killed by mysterious creatures. A substantial influence on Bird Box could well have been John Wyndham’s novel The Day of the Triffids (1951) in which all of humanity bar a handful of people are blinded by the radiation from a comet and the survivors find themselves at prey from a horde of killer plants. This has been filmed several times with The Day of the Triffids (1962) and the tv mini-series’ The Day of the Triffids (1981) and The Day of the Triffids (2009). However, A Quiet Place was merely the most successful among a bunch of similar films featuring catastrophes in which one of the key human senses or faculties is impaired. See also the likes of Blindness (2008) where the whole world is affected by a plague of blindness; Perfect Sense (2011), which imagines what would happen if people started losing their senses one by one; The Last Days (2013) where the world is devastated by a plague of agoraphobia; and Embers (2015) where the entire population suffers from periodic retrograde amnesia. 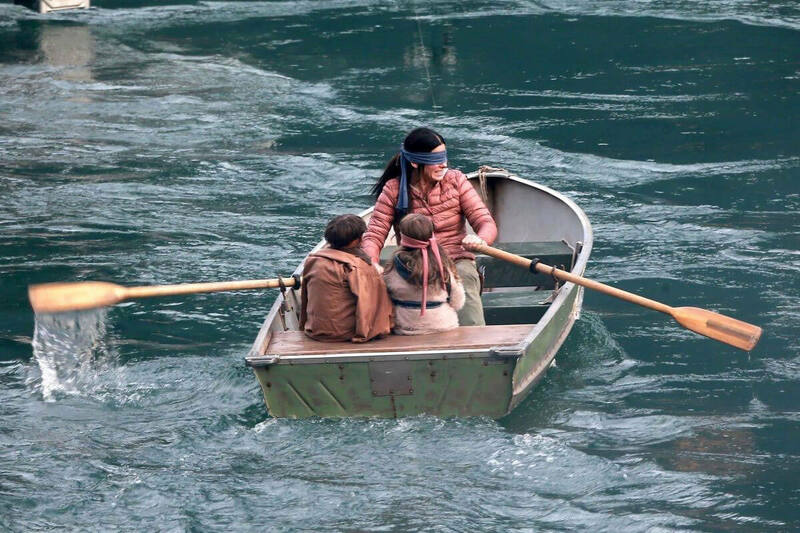 The world of Bird Box intrigued me from the opening scenes where Sandra Bullock gets the two children (Vivien Lyra Blair and Julian Edwards) to get in a canoe and they set off down a river with blindfolds over their faces amid dire warnings that they will be killed if they take them off. This is followed by flashbacks to the start of the catastrophe where things suddenly impact – a woman in the hospital abruptly trying to bash her brains out against a big glass window and Sandra’s sister Sarah Paulson calmly sitting down inside a burning car. Apart from these intriguing opening scenes, Bird Box never quite sustains itself with the same seat-edge dramatic intensity that A Quiet Place did. The sole scene that it does so is the one where Tom Hollander enters the house and abruptly begins to open the blinds, grabbing people and forcing their eyes open to make them look. Mostly the film has weird fun building the basic dramatic situation out such as the group’s efforts to go and obtain supplies by travelling to the supermarket in a car with blacked-out windows relying solely on the satnav. By contrast, A Quiet Place was built around a series of gripping scenes where people must hide lest they make a sound but there is not the same sense here. A scene where Sandra Bullock and the kids navigate rapids in the canoe while still blindfolded lacks the seat-edge intensity it would have had if A Quiet Place’s John Kraskinski were directing. My feeling is that it is a case of Susanne Bier being more of a people director rather than one who is experienced in suspense mechanics. The biggest frustration of Bird Box for me was the lack of explanations about what is going on. There are even less given about what is going on than there were in A Quiet Pace – there at least we got to see the creatures. Here all we see are leaves blowing in unnatural patterns, something moving outside or through the trees (but it never being clear what is there) and people having visions of something, although we are never privy to what they are or where they come from. There is zero explanation of what caused the catastrophe, what the supposed creatures are and who the people suddenly attacking the group and forcing them to look are.